Literally the word means wind and water, the two elements that mold the earth in the most meaningful way. It is not by chance that in the Orient the large stones worked only by the wind and erosion by water, called gōngshí, are considered actual works of art. Fēng Shuǐ can be understood as the Genius Loci of Augustus tradition, widely covered in the issues of contemporary architecture by architect Norberg-Schultz. In Hong Kong Fēng Shuǐ is the basis of every architectural project. 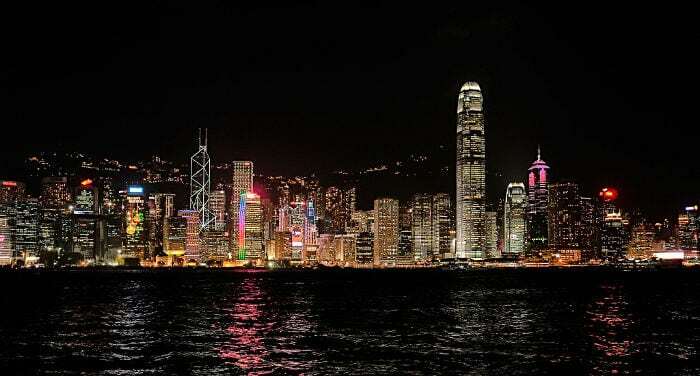 The city itself of Hong Kong is known as a place of Fēng Shuǐ favored for its position in relation to continental China. The mountain chain of Guangdong Province symbolize the back of a moving dragon descending toward the island, crossing the waters of Victoria Harbour and creating a visible harmony between heaven and earth, favorable for prosperity and stability. The Asian dragon, lóng in Chinese, is in net contrast with the mythological creatures of western origin: it is a benevolent protector, and as such it is thanked and ingratiated. Don’t be surprised if in many residential buildings in the city you note more or less wide openings that seem to defy every rule of the static: they are just a comfortable road to allow the dragons to arrive from the mountains to the sea without finding obstacles along the way. 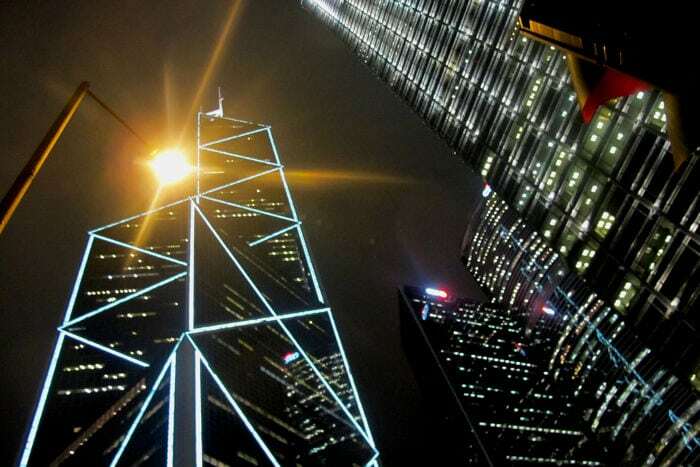 At the end of the 80’s, the Bank of China Tower, today an integral part of the city skyline, was at the center of a heated debate, never fully resolved, for its design outside the canon required by tradition. Architect Ieho Ming Pei, of Chinese origin, raised and educated in the United States, already the designer of the Louvre Pyramid, was accused of putting the island’s economy at risk because his design went against every concept of Fēng Shuǐ, with its overly pointy profiles that look like blades, and the X that you can see there, represented by corners and angles. To balance out the danger of unfortunate events, the skyscraper was inaugurated August 8th (eighth month) 1988, considered to be the luckiest day of the century, and a sufficiently good auspice to avert the worst. A few years before the new headquarters of HSBC was inaugurated, right nearby, work of English architect Sir Norman Foster. In the design a Fēng Shuǐ Master was consulted to guarantee positive energy: nothing was left to chance, from lions on guard at the entrance, symbolizing the yin and yang, to the location of internal staircases that respect the logic of the discipline. Fēng Shuǐ also sets the rules for the choice of materials and colors, the orientation of the furniture in relation to the cardinal directions and entrances, even giving direction on preferred decorations. The Masters of the ancient art get paid handsomely to establish how to arrange objects in the most favorable way, even giving advice on where to put a computer or printer to boost business. Even Disney gave in to the good luck rules and the main entrance of Disneyland Hong Kong was moved to favor the alignment of waters with the mountains. A real estate agent told me about the curious case of a negative atmosphere office. It was a little space in a wonderful position in the financial district. Well, once the contract with the previous English tenant ended, it remained vacant for more than a year (a lasting record for a city where the real estate offerings change weekly). The cause has been attributed to the presence of a central column that “interrupts” the flow of energy: no Hongkonger wanted to take the risk of moving their company to a less “lucky” environment. The French woman that finally accepted the challenge and risk of it ruining their business had already reaped a huge benefit, renting it for half the asking price. Each year Fēng Shuǐ Masters make horoscopes and personalized almanacs, giving their customers a series of advice tied to the dates and activities to do: there will be a lucky day for business, but also the best days to travel without risk, when to begin a new business and so forth, up to the best day to shave their beard or cut their hair. And obviously the influence of the day of birth and marriage… The power of Fēng Shuǐ. Greetings from Hong Kong, where it’s already tomorrow. Ginevra Niccolini Serragli, after living in Switzerland for years, moved to Hong Kong, the city where the past meets the future, the West meets the East. Ginevra is the found of Italian Excellence, a company that aims at promoting the "Made in Italy".